For the World War II battle, see Battle of the Lys (1940). The Battle of the Lys (Portuguese: Batalha de La Lys) from 7 to 29 April 1918, was part of the 1918 German offensive in Flanders during World War I, also known as the Spring Offensive. It was originally planned by General Ludendorff as Operation George but was reduced to Operation Georgette, with the objective of capturing Ypres, forcing the British forces back to the channel ports and out of the war. In planning, execution and effects, Georgette was similar to (although smaller than) Operation Michael, earlier in the Spring Offensive. The German attack zone was in Flanders, from about 10 kilometres (6.2 mi) east of Ypres in Belgium to 10 kilometres (6.2 mi) east of Béthune in France, about 40 kilometres (25 mi) south. The front line ran from north-north-east to south-south-west. The Lys River, running from south-west to north-east, crossed the front near Armentières in the middle of this zone. The front was held by the Belgian Army in the far north, by the British Second Army (under Plumer) in the north and centre and by the British First Army (under Horne) in the south. The German attacking forces were the Sixth Army in the south (under Ferdinand von Quast), and the Fourth Army in the north (under Sixt von Armin). Both armies included substantial numbers of the new stosstruppen, trained to lead attacks with the new stormtroop tactics. The British First Army was a relatively weak force; it included several worn-out formations that had been posted to a "quiet sector". This included two divisions of the Portuguese Expeditionary Corps, which were undermanned, lacked almost half of their officers, had very low morale and were set to be replaced the day of the German attack. The German plan was to break through the First Army, push the Second Army aside to the north, and drive west to the English Channel, cutting off British forces in France from their supply line which ran through the Channel ports of Calais, Dunkirk and Boulogne. The German bombardment opened on the evening of 7 April, against the southern part of the Allied line between Armentières and Festubert. The barrage continued until dawn on 9 April. The Sixth Army then attacked with eight divisions. The German assault struck the Portuguese Second Division, which held a front of about 11 kilometres (6.8 mi). The Portuguese division was overrun and withdrew towards Estaires after hours of heavy fighting. [a] The British 55th Division, to the south of the Portuguese in a more defensible position, pulled back its northern brigade and held its ground for the rest of the battle, despite attacks from two German reserve divisions. The British 40th Division (to the north of the Portuguese) collapsed under the German attack and fell back to the north. Horne committed his reserves (First King Edward's Horse and the 11th Cyclist Battalion) to stem the German breakthrough but they too were defeated. The Germans broke through 15 kilometres (9.3 mi) of front and advanced up to 8 kilometres (5.0 mi), the most advanced probe reaching Estaires on the Lys. There they were finally halted by British reserve divisions. 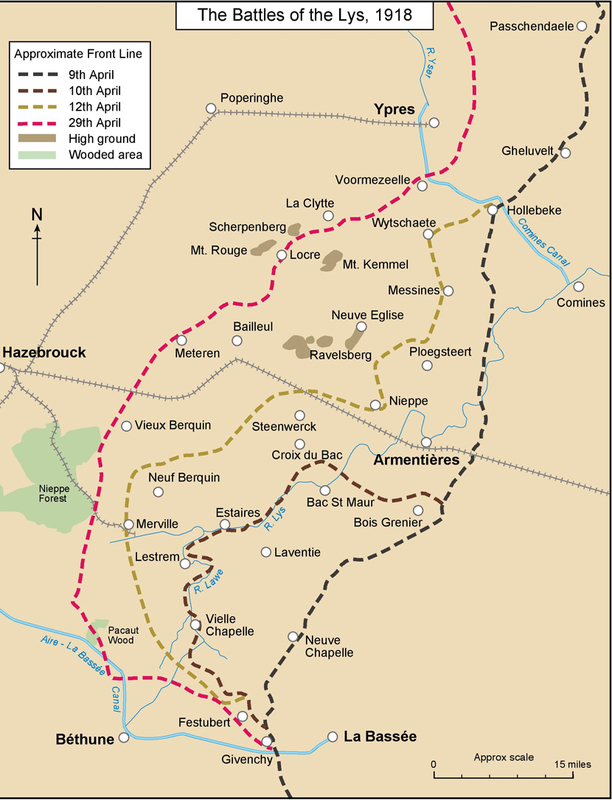 On 10 April, the Sixth Army tried to push west from Estaires but was contained for a day; pushing north against the flank of the Second Army, it took Armentières. Also on 10 April, German Fourth Army attacked north of Armentières with four divisions, against the British 19th Division. The Second Army had sent its reserves south to the First Army and the Germans broke through, advancing up to 3 kilometres (1.9 mi) on a 6 kilometres (3.7 mi) front, and capturing Messines. The 25th Division to the south, flanked on both sides, withdrew about 4 kilometres (2.5 mi). By 11 April, the British situation was desperate; it was on this day that Haig issued his famous "backs to the wall" order. On 12 April, the Sixth Army renewed its attack in the south, towards the important supply centre of Hazebrouck, another 10 kilometres (6.2 mi) to the west. The Germans advanced some 2–4 kilometres (1.2–2.5 mi) and captured Merville. On 13 April they were stopped by the First Australian Division, which had been transferred to the area. The British Fourth Division defended Hinges Ridge, the Fifth Division held Nieppe Forest and the 33rd Division was also involved. From 13–15 April, the Germans drove forward in the centre, taking Bailleul, 12 kilometres (7.5 mi) west of Armentières, despite increasing British resistance. Plumer assessed the heavy losses of the Second Army and the defeat of his southern flank and ordered his northern flank to withdraw from Passchendaele to Ypres and the Yser Canal; the Belgian Army to the north conformed. On 23 March, Haig had ordered Plumer to make contingency plans to shorten the line along the Ypres Salient and release troops for the other armies. On 11 April, Plumer authorised a withdrawal of the southern flank of the Second Army and ordered the VIII and II corps in the Passchendaele Salient to retreat the next day into the Battle Zone, behind outposts left in the Forward Zone of the British defensive system. The divisional commanders were ordered that the Forward Zone must be held and that the Germans must not be given the impression that a withdrawal was in progress. At noon on 12 April, the VIII Corps ordered the infantry retirement to begin that night and the 59th Division was withdrawn and transferred south, to be replaced by part of the 41st Division. 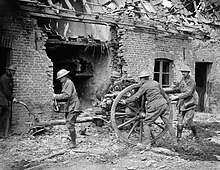 The II Corps had begun to withdraw its artillery at the same time as VIII Corps on the night of 11/12 April and ordered the 36th and 30th divisions to conform to the VIII Corps withdrawal which were complete by 13 April, without German interference; VIII Corps HQ was transferred to reserve. During 13 April, General Headquarters (GHQ) discussed the retirements in the Lys valley, which had lengthened the British front line and Plumer agreed to a retirement in the Ypres Salient to the Mt Kemmel, Voormezeele (2.5 mi (4.0 km) south of Ypres), White Château (1 mi (1.6 km) east of Ypres) to Pilckem Ridge defence line but ordered only that artillery ammunition be carried to the rear; the 4th Army reported on 14 April, that the British were still occupying the Passchendaele Salient. The next day was quiet in the salient and the withdrawal of the II Corps and XXII Corps divisions was covered by the outposts in the original front line and artillery, which was divided into some active batteries which fired and a greater number of batteries kept silent, camouflaged and not to fire except in an emergency. [b] Plumer gave orders to begin the retirement by occupying the line before the night of 15/16 April, while maintaining the garrisons in the outpost line and holding the Battle Zone with a few troops as an intermediate line. During the night of 15/16 April, the outpost line garrisons were to be withdrawn behind the new front line at 4:00 a.m. and the intermediate line in front of the Battle Zone was to be held as long as possible, to help the troops in the new line to get ready. On 16 April, patrols went forward during the morning and found the area between the old and new front lines to be empty, the Germans still apparently in ignorance of the retirement; one patrol captured a German officer scouting for observation posts who did not know where the British were. Only in the late afternoon did German troops begin to close up to the new line and the British troops in the Battle Zone easily repulsed the German infantry, the 4th Army diary recorded that patrols discovered the withdrawal at 4;40 a.m. that afternoon. On 17 April, the Belgian Army defeated an attack from Houthulst Forest (The Battle of Merckem) against the 10th and 3rd Belgian divisions from Langemarck to Lake Blankaart by the 58th, 2nd Naval and the 6th Bavarian divisions, with help from the II Corps artillery. The Germans captured Kippe but were forced out by counter-attacks and the line was restored by nightfall. On the afternoon of 27 April, the south end of the outpost line was driven in when Voormezeele was captured, re-captured and then partly captured by the Germans; another outpost line was set up north-east of the village.. Belgian losses were 619 killed, wounded or missing. The Germans lost between 1922 and 2354 men of which 779 prisoners. The Kemmelberg is a height commanding the area between Armentières and Ypres. On 17–19 April, the German Fourth Army attacked and was repulsed by the British. On 18 April, the German Sixth Army attacked south from the breakthrough area toward Béthune but was repulsed. French marshal, Foch, had recently assumed supreme command of the Allied forces and on 14 April agreed to send French reserves to the Lys sector. A French division relieved the British defenders of the Kemmelberg. From 25–26 April, the Fourth Army made a sudden attack on the Kemmelberg with three divisions and captured it. This success gained some ground but it made no progress toward a new break in the Allied line. On 29 April, a final German attack captured the Scherpenberg, a hill to the north-west of the Kemmelberg. More French reinforcements arrived in the latter part of April, the Germans had suffered many casualties, especially among the stoßtruppen and attacks toward Hazebrouck failed. It was clear that Georgette could not achieve its objectives; on 29 April the German high command called off the offensive. In 1937 C. B. Davies, J. E. Edmonds and R. G. B. Maxwell-Hyslop, the British official historians gave casualties from 9–30 April as c. 82,000 British and a similar number of German casualties. Total casualties since 21 March were British: c. 240,000, French: 92,004 and German: 348,300. In 1978 Middlebrook wrote of 160,000 British casualties, 22,000 killed, 75,000 prisoners and 63,000 wounded. Middlebrook estimated French casualties as 80,000 and German as c. 250,000 with 50–60,000 lightly wounded. In 2002 Marix Evans recorded 109,300 German casualties and the loss of eight aircraft, British losses of 76,300 men, 106 guns and 60 aircraft and French losses of 35,000 men and twelve guns. In 2006 Zabecki gave 86,000 German, 82,040 British and 30,000 French casualties. ^ This action was one of the greatest defeats ever suffered by Portuguese forces. The Portuguese Expeditionary Corps had been reorganising so that the Second Portuguese Division of General Gomes da Costa was to have four brigades at full strength and all the artillery of the corps and the First Portuguese Division, which would contain two depleted brigades and be withdrawn. The Second Division had a total of c. 21,000 men, of whom 17,000 were infantry, a deficit of 6,139 men; the division lost c. 7,000 casualties. Despite the defeat, acts of remarkable bravery were shown by some Portuguese soldiers; Aníbal Milhais (nicknamed "Soldier Millions") repulsed two German assaults single-handedly with a Lewis gun, while covering the retreat of Portuguese and Scottish troops. ^ XXII and II corps divisions were the 30th, 36th, 41st, 6th and brigades of the 49th and 21st divisions. ^ Edmonds, Davies & Maxwell-Hyslop 1995, pp. 154–155. ^ Edmonds, Davies & Maxwell-Hyslop 1995, pp. 159–163. ^ Edmonds, Davies & Maxwell-Hyslop 1995, p. 155. ^ Edmonds, Davies & Maxwell-Hyslop 1995, pp. 159–160. ^ Edmonds, Davies & Maxwell-Hyslop 1995, pp. 149–155. ^ Edmonds, Davies & Maxwell-Hyslop 1995, pp. 147–148, 168. ^ Rodrigues 2013, p. 19. ^ Edmonds, Davies & Maxwell-Hyslop 1995, pp. 156, 165–174. ^ Edmonds, Davies & Maxwell-Hyslop 1995, p. 174. ^ Edmonds, Davies & Maxwell-Hyslop 1995, pp. 174–197. ^ Edmonds, Davies & Maxwell-Hyslop 1995, pp. 193, 200–204. ^ Edmonds, Davies & Maxwell-Hyslop 1995, pp. 204–209. ^ Edmonds, Davies & Maxwell-Hyslop 1995, pp. 222, 249–254. ^ Edmonds, Davies & Maxwell-Hyslop 1995, pp. 254–281, 305–329. ^ Becke 2007, pp. 63, 71. ^ Edmonds, Davies & Maxwell-Hyslop 1995, pp. 284–329. ^ Edmonds, Davies & Maxwell-Hyslop 1995, pp. 113–114, 245, 275. ^ Edmonds, Davies & Maxwell-Hyslop 1995, p. 326. ^ Edmonds, Davies & Maxwell-Hyslop 1995, pp. 299–300, 319, 316, 326. ^ Edmonds, Davies & Maxwell-Hyslop 1995, pp. 337–338, 342, 443. ^ "100 jaar geleden: de eerste Belgische overwinning" (in Dutch). ^ Edmonds, Davies & Maxwell-Hyslop 1995, pp. 341–368. ^ Edmonds, Davies & Maxwell-Hyslop 1995, pp. 357–363. ^ Edmonds, Davies & Maxwell-Hyslop 1995, pp. 409–428. ^ Edmonds, Davies & Maxwell-Hyslop 1995, pp. 428–440. ^ Edmonds, Davies & Maxwell-Hyslop 1995, pp. 442–452. ^ Edmonds, Davies & Maxwell-Hyslop 1995, pp. 482–483, 487–490. ^ Middlebrook 1978, pp. 347–348. ^ Marix Evans 2002, p. 81. ^ Zabecki 2006, p. 349. Baker, Chris (2011). The Battle for Flanders: German Defeat on the Lys, 1918. Barnsley: Pen & Sword Military. ISBN 978-1-84884-298-4. Becke, Maj A. F. (2007) . History of the Great War: Order of Battle of Divisions, Part 1: The Regular British Divisions (Naval & Military Press, Uckfield ed.). London: HMSO. ISBN 978-1-84734-738-1. Edmonds, J. E.; Davies, H. R.; Maxwell-Hyslop, R. G. B. (1995) . Military Operations France and Belgium: 1918 March–April: Continuation of the German Offensives. History of the Great War Based on Official Documents by Direction of the Historical Section of the Committee of Imperial Defence. II (Imperial War Museum & Battery Press ed.). London: Macmillan. ISBN 978-0-89839-223-4. Henriques, M. C.; Leitão, A. R. (2001). La Lys, 1918 ("Batalhas de Portugal"). Lisboa: Prefácio. ISBN 978-972-8563-49-3. Marix Evans, M. (2002). 1918: The Year of Victories. London: Arcturus. ISBN 978-0-572-02838-1. Middlebrook, M. (1983) . The Kaiser's Battle (Penguin reprint ed.). London: Allen Lane. ISBN 978-0-7139-1081-0. Zabecki, D. T. (2006). Operational Art and the German 1918 Offensives (PhD). London: Routledge. ISBN 978-0-415-35600-8. Retrieved 3 October 2013. Rodrigues, H. (2013). "Portugal in the Great War". France at War. Archived from the original on 4 October 2013. Retrieved 2 October 2013. Rickard, J. (27 August 2007). "Battle of the Lys, 9–29 April 1918". Military History Encyclopedia on the Web. OCLC 704513317. Retrieved 2 October 2013. Pyles, J. (2012). "The Portuguese Expeditionary Corps in World War I: From Inception to Destruction, 1914–1918" (PDF). MA. Texas US: University of North Texas. OCLC 823504820. Retrieved 2 October 2013. Wikimedia Commons has media related to Battle of the Lys. This page was last edited on 22 March 2019, at 20:49 (UTC).